SAN DIEGO, Feb. 5, 2019 /PRNewswire/ -- Cubic Corporation (NYSE: CUB) today announced that its Cubic Mission Solutions (CMS) business division has launched a new expansion module for the Vocality Radio over IP (RoIP). The RoIP Connect is a simple-to-use and easy-to-install expansion module that adds an additional four audio ports, four serial ports and a general-purpose input/output (GPIO) to the Vocality RoIP through a single USB connection. "Our Vocality RoIP, a leading interoperability gateway, is already providing an important migration path from traditional Push-to-Talk radios to Push-to-Talk over cellular. The RoIP Connect further expands the capacity of the Vocality RoIP with the addition of up to eight audio ports, while continuing to maintain a small form factor," said Mike Barthlow, vice president and general manager, Rugged IoT Solutions, CMS. "We're pleased to offer the RoIP Connect expansion module to further advance the capabilities of the Vocality RoIP for our customers." When connected to the Vocality RoIP, the RoIP Connect is detected automatically and newly added ports will be displayed in the RoIP management interface to ensure a seamless user experience across all ports. 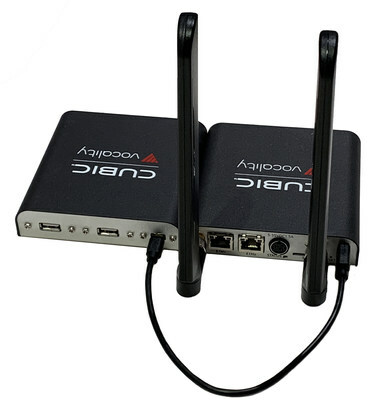 Two RoIP Connects can be used with the Vocality RoIP for increased capacity with no additional cabling or power sources. Additionally, the RoIP Connect is fully compatible with the Vocality Rack Kit, a rack-mountable solution for the Vocality RoIP that allows up to three RoIP devices to be mounted side by side in standard racks and cabinets. When the RoIP Connect is used together with Vocality RoIP, customers can create up to a 12 port Radio over IP 19" 1u rack solution. Benefiting from Cubic's unique software licensing model, RoIP Connect users can grow their Radio over IP system requirements quickly and easily. For more information, visit Cubic's website.